LOVE 4 TENNIS Academy member Dominik Sujova (17) has played at two tournaments in Israel, in Haifa and Kiryat Shmona. 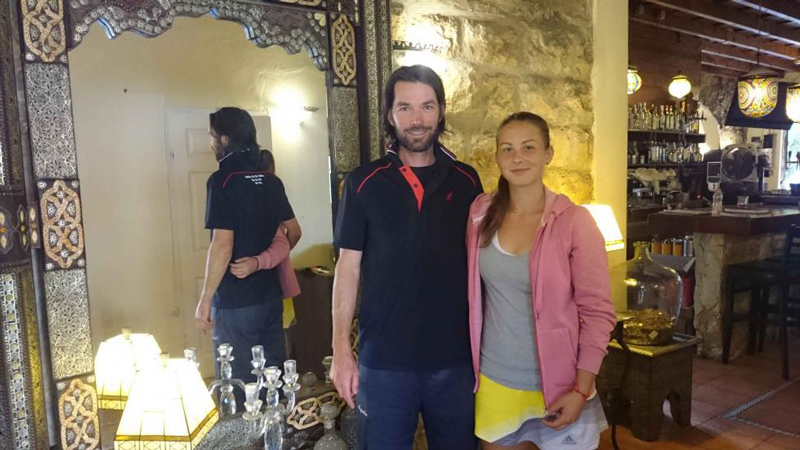 Erik Csarnakovics joined her in Israel and he praises Dominika not only for her results and performances but also for her dedication for the game. Dominika reached third round in first junior tournament (Grade 3) and also made doubles quarterfinals, in her second tournament she was even better to make the singles final and doubles quarterfinals. In the combined ITF ranking, she made it to 209th spot in the ranking, and she is third best in her age category (Under 18) in Slovakia. “I was not disappointed about her first tournament, she beat home player Akler. This player plays professionally with French coach. Dominika did well. Taking into consideration it was her first time taking flight to go for a foreign hard tournament. Yes, she lost in the third round with Russian Lansere (2-6 in third set), but both players were on similar level. Russian did well on both tournaments. Pity, she could not make more points from doubles at both,” said Erik Csarnakovics in the beginning. Dominika had only ten days to prepare, she was out for a month. She was on holidays and also had a training camp. “Results she made at the end of the season, those are not coincidental results of a shot term tennis form, and she reached higher level of play. She is playing at the level of girls from the end of first hundreds of junior ranking,” adds head coach of the academy. And what about the progress in her game? “Dominika improved her serve and backhand. Those were targets, which she had when she joined us. First serve and backhand are becoming her weapons, not like in the past. And about the mental aspect of the matches, that’s the biggest amount of work she did. There is no lost match for her, even being down 1-4, 1-5 or 0-40 in any game,” adds coach. Sujova plays only her second “profi ” season, however it is too soon for women’s tournaments. “She does not have the experience from her age category at international level. She was never at junior grand slam, where she would see how players are preparing for big matches. Often players get to their first grand slams for adults, when they are 21-22 years old,” says Csarnakovics, who also praises then dedication of LOVE 4 Tennis Academy. “When I compare my travels around with different players, she is in TOP 5 with one of the best dedications to tennis. She is critical to herself, there was no problem with her acceptance of my criticism. It was very easy and pleasant stay in Israel. This is how coach imagines it all,” adds Csarnakovics.